The dental implants themselves are tiny titanium posts, which are inserted into the jawbone where teeth are missing. These metal anchors act as tooth root substitutes. They are surgically placed into the jawbone. The bone bonds with the titanium, creating a strong foundation for artificial teeth. Small posts are then attached to the implant, which protrude through the gums. These posts provide stable anchors for artificial replacement teeth. Dental implants also help preserve facial structure, preventing bone deterioration that occurs when teeth are missing. For most patients, the placement of dental implants involves two surgical procedures. First, implants are placed within your jawbone. For the first three to six months following surgery, the dental implants are beneath the surface of the gums gradually bonding with the jawbone. You should be able to wear temporary dentures and eat a soft diet during this time. At the same time, your dentist is forming new replacement teeth. After the dental implant has bonded to the jawbone, the second phase begins. Dr. Knibbe at our Northern Kentucky oral surgery office in Florence KY will uncover the dental implants and attach small posts, which will act as anchors for the artificial teeth. These posts protrude through the gums. When the artificial teeth are placed, these posts will not be seen. The entire procedure usually takes six to eight months. Most patients experience minimal disruption in their daily life. Using the most recent advances in dental implant technology, Dr. Knibbe at our Northern Kentucky oral surgery office in Florence KY is able to place single stage implants. These dental implants do not require a second procedure to uncover them, but do require a minimum of six weeks of healing time before artificial teeth are placed. There are even situations where the dental implants can be placed at the same time as a tooth extraction – further minimizing the number of surgical procedures. Advances in dental implant technology have made it possible, in select cases, to extract teeth and place dental implants with crowns at one visit. This procedure, called immediate loading, greatly simplifies the surgical process. Dental implants are a team effort between an Oral and Maxillofacial Surgeon and a Restorative Dentist. While Dr. Knibbe performs the actual dental implant surgery, and initial tooth extractions and bone grafting if necessary, the restorative dentist (your dentist) fits and makes the permanent prosthesis. 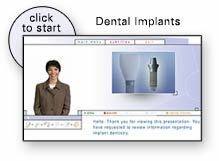 Your dentist will also make any temporary prosthesis needed during the implant process. A single prosthesis (crown) is used to replace one missing tooth each prosthetic tooth attaches to its own implant. A partial prosthesis (fixed bridge) can replace two or more teeth and may require only two or three implants. A complete dental prosthesis (fixed bridge) replaces all the teeth in your upper or lower jaw. The number of dental implants varies depending upon which type of complete prosthesis (removable or fixed) is recommended. A removable prosthesis (over denture) attaches to a bar, ball in socket, or locator attachments, whereas a fixed prosthesis is permanent and removable only by the dentist. Dr. Knibbe performs in-office dental implant surgery in a hospital-style operating suite, thus optimizing the level of sterility. Inpatient hospital dental implant surgery is for patients who have special medical or anesthetic needs or for those who need extensive bone grafting from the jaw, hip or tibia. Loose dentures and ill fitting dentures can be troublesome and inhibit your interactions with others. Loose dentures and poor fitting dentures are candidates for replacement with dental implants. Call our oral surgeons at our Northern Kentucky oral surgery office in Florence KY to see if dental implants can replace your loose dentures. If you are considering dental implants, your mouth must be examined thoroughly and your medical and dental history reviewed. If you mouth is not ideal for dental implants, ways of improving outcome, such as bone grafting, may be recommended. Once the dental implants are in place, they will serve you well for many years if you take care of them and keep your mouth healthy. This means taking the time for good oral hygiene (brushing and flossing) and keeping regular appointments with your dental specialists. Please contact Dr. Knibbe at our Northern Kentucky oral surgery office in Florence KY for more information.